JEST 2019 admit cards download and the JEST exam will be conducted on February 17, 2019. 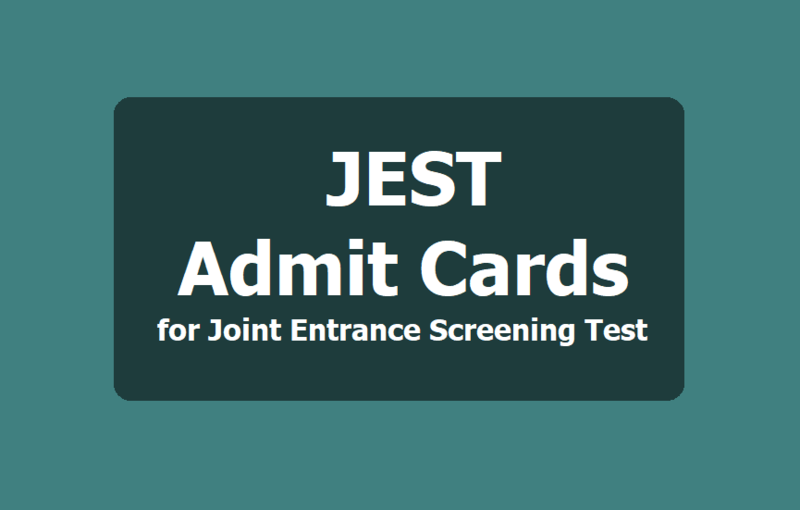 JEST 2019 admit cards have been released on the official website. The admit cards for the Joint Entrance Screening Test (JEST) 2019 have been released on January 22, on the official website - jest.org.in. According to the latest notification, the exam will be conducted on February 17, 2019. The JEST score secured by students in the exam will be valid for one year. JEST 2019 will be held on Sunday, February 17, 2019. Ph D (Physics): The candidates need to possess master's degree in Physics. Ph D (Theoretical Computer Science at IMSc): The candidates should hold a master's degree in Science/ Engineering or Technology in Computer Science and related streams. Ph D (Neuroscience at NBRC): The candidates should have a master's degree in Physics or Mathematics, apart from it, bachelor's degree in Engineering or Technology or master's degree in Computer Science. Ph D (Computational Biology at IMSc): The candidate should possess a postgraduate degree in Science/ Engineering/ Technology/ Computer Application or Science. Integrated MSc/ MTech - PhD (Physics): For Indian Institute of Astrophysics, candidates should possess bachelor's degree in Physics/ Mathematics/ Engineering/ Technology. JEST is considered as a National Eligibility Test (NET). The applicants who are willing to take admission in PhD / Integrated PhD Programme in Physics or Theoretical Computer Science or Neuroscience or Computational Biology in one of the participating institutes may appear for the JEST at one of the exam centres.